Just trying to figure out if my car is misfiring under load. Can anyone take a look at this log and tell me if that is what happens when the car misfires? Bank 1 will momentarily go lean for a split second under WOT. And it always seems to happen when the injector duty cycle reaches around 43-48% under the WOT, at which point injectory duty on bank 1 will drop to 4% for that split second and then go back up to where it was. 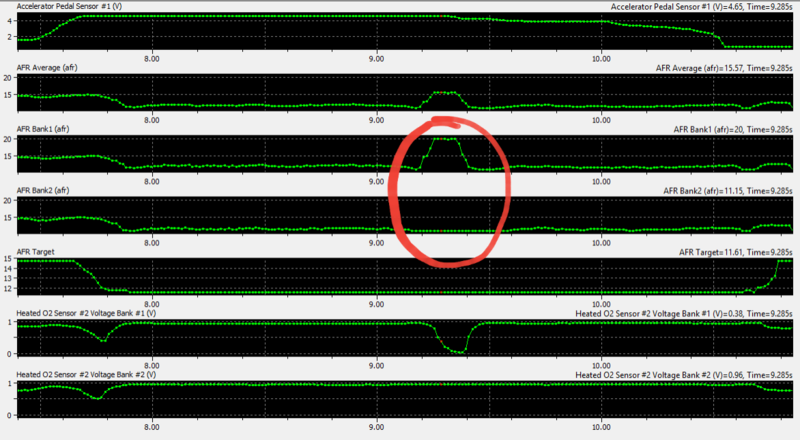 In other words, it seems to me that the injector bank 1 will shut off for that period and then back on.